Side Entry Mixers Made in the U.S.A. The Jensen Mixer Model 6500 gear box typifies the superior design engineering that has gone into every part of the Jensen Series 500 Mixer. Maximum gear loading is 54% of rated capacity. Bearings have been selected for extremely long life even in continuous, heavy duty service. 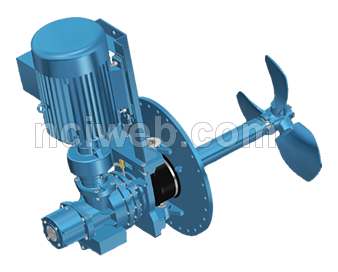 The lower flexible coupling half provides rain and dirt protection for the upper pinion bearing. Internal air volume has been reduced to eliminate condensate problems in tropical and coastal areas. Gear case parts are of high strength, 356-T6 heat treated aluminum alloy. The body is of heat resistant steel to assure positive protection against product leakage under conditions of high temperature. The gear box may be removed as a unit for shop maintenance without disturbing motor mount alignment or moving coupling halves. No shaft realignment is required when reinstalling the gear box. Gear inspection is simplified by the cartridge type pinion assembly which may be removed easily and replaced without re-adjustment. All moving parts are completely enclosed by protective covers. Housings have rabbeted joints for positive alignment and are O-ring sealed. Gear box housings form a protective enclosure around the mechanical seal, eliminating exposure to the elements and resulting in longer seal life.